Philippines has never been far from my thoughts since my trip to Manila last year. I made a promise to visit the beautiful country again, so I jumped at the chance when I managed to get cheap flights for a short getaway to Cebu. 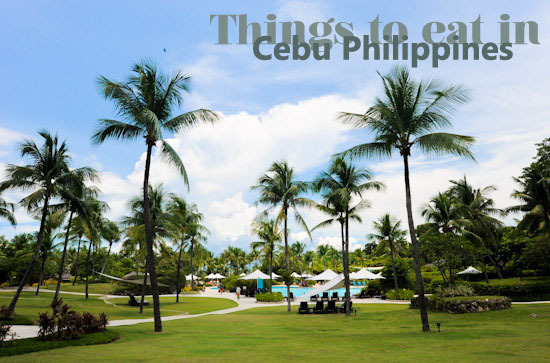 Cebu – one of the most developed provinces in the country – is a province in the Philippines which consists of the main Cebu Island and 167 surrounding islands. Alongside Boracay, it is also a top tourist destination in Philippines. Here’s my list of 10 things to eat in Cebu Philippines. Travelling is just an excuse for me to eat more. I shall jump straight to the best thing that I had in Cebu – Zubuchon lechon (whole roasted pig). All you need to know is Zubuchon has the best lechon. You MUST TRY it if you are in Cebu. Besides the famous lechon (P240 half kilo or SGD$7/P450 for 1kg or SGD$13.2), we also had the equally good Lechon Sisig (P190). Zubuchon has other dishes like Lechon Crispy Pata (P450 or SGD$13), Roasted Pork Belly (P380 or SGD$11) and Slow-Cooked Pork Belly (P220 or SGD$6.5) on the menu. Note: Zubuchon is no longer at Banilad Town Center. “Go to La Marea and eat all the desserts there,” my friend Trixie told me. La Marea is a dessert place in Cebu that has a range of cakes and pastries at affordable prices. We went there twice during our stay in Cebu and tried quite a few desserts. Of course, there were hits and misses. Just make sure you try the warm Brownie Cup (P100 or SGD$3) which comes in flavours like chocolate, apple crumble, blueberry, and white chocolate. I was reading some of the Cebu food blogs to research on places to eat, and some of them raved about the food at Mooon Cafe (it’s spelled with three Os). I think a few reviews even went out on a limb to call it the best restaurant in Cebu. It is not hard to understand why Mooon cafe is so popular. They serve decent food at affordable prices, and it has an electrifying atmosphere. However, the food is not consistent. We were there during the first night, and we really enjoyed the Mexican Baby Back Ribs (P198 or SGD$5.8) and Mooon Steak (P176 or SGD$5). But when we went back for lunch again, the same baby ribs was lacking in flavour and the Pork Chops (P158 or SGD$4.6) was too salty. That said, Mooon Cafe is still a nice place to have dinner when you are in Cebu. For the best pork ribs in Cebu, go to Casa Verde. Their menu has a wide range of offerings like Burgers (P180 or SGD$5.2), sandwiches (P158 or SGD$4.6), chicken (P170 or SGD$5), seafood (P178 or SGD$5.2) and of course, the best seller pork ribs (P198 or SGD$5.8). It is a must to eat chicken inasal when you are in Philippines. With 408 branches all over the country, Mang Inasal – Philippines fastest growing barbecue fast food chain – is probably the most accessible option for chicken inasal. Cebu Larsian BBQ is the answer most people reply when you ask them what to eat in Cebu. Larsian is like our hawker centre with rows of stalls that serve BBQ meat and seafood. I don’t have the exact address, just tell the taxi Larsian near Near Chong Hua Hospital. If you are looking for street food in Cebu, Larsian is probably the place to go. There’s no such thing as too much lechon. Besides Zubuchon, CnT Lechon is another place that is famous for the roast pig. A Cafe by the Abaca group is easily one of my favourite restaurants in Cebu. We loved it so much that we actually went there for dinner twice. Definitely a must-visit in Cebu. A restaurant that has consistently been voted as one of the best restaurants in Cebu, Maya Mexican restaurant (also under the Abaca group) is the place to go for good Mexican food. No one leaves Philippines without getting brownies from Goldilocks. I’m so glad that you visited Cebu, my hometown! ? I love this post and would recommend all the places you’ve been at! Everything looks soooo good. Especially the lechon. Zubuchon Lechon has a new store in Escario, near Capitol. Hey, if you think the brownies from Goldilocks is good, then you MUST try Max’s! They serve it in Air Philippines, its moist, sweet and SUPER GOOD. Good thing you enjoyed Cebu.. try to venture out a trip to Manila or Boracay too! They have some good finds there! And cheap too! AGREE to all you said! My filipino colleague bought us a box of Caramel/Brownie bars from Max’s and they are so goood!! They are cut into bite sized squares and sadly you can’t find them in Sg. When in Cebu, it is also a must to buy Dried Mangoes, as well as go shopping for Danggit in Taboan Market. I love that the #1 was the brownies from Goldilocks! I love it too!! The two Cebu Lechon places that you mentioned are good, you should also try Rico’s Lechon or Carcar’s lechon, the only cebu lechon with sauce made from its own drippings. For me, the latter are the best of the best. Fatty but who cares. hey, where would a nice place to stay with nice beaches and amenities and food of course? oh how I miss Cebu! :D great choices! which one is your fave? I’m going to Cebu in a few weeks! This post really helped. Will definitely hit A Cafe, Mooon Cafe and try out the street food! If you eat beef, should try the best beef stew in the world ‘Pochero’ in Kusina Uno or Abuhan. A dish to try when you go back to Cebu. Should try Lantaw restaurant as well. My friends from Singapore and MY love it very much. oh my God! I missed my homeland- CEBU! now craving for lechon. and hey, have you tried “dinuguan’? Hi!I read your blog before I visited Cebu last August 9. Out of the ten things that you listed, I tried 4 of them (Zubuchon, Casa Verde, La Merea, CNT Lechon). This post was really helpful since it was our first time to roam Cebu without a guide. You missed Abuhan’s Pochero. Simply heavenly. This is really great but I don’t think this is right. There are some food found here that is way better than the food here, in my opinion. Just saying. Hi!i like cebu better not crowded not too many people around there and many beaches and have many choices to explore there.try to travel in Malapascua or in fuertofino,or try to go in panglao bohol is very nice one of my greatest experience in the history of my life.i had so much fun and enjoyable place because hav many tourist there nice beaches and have restaurants along the beach,try to travel in bantayan Island also is the place where i was born. Hi! I’m Shiela, aspiring food-blogger, focusing in pastries. Having read this post was such an inspiration! I’d love to hear some suggestions about the pastry houses here in Cebu or even (if it’s not too much and since I only recently started what i call, “researching”) from every pastry shop you’ve been to! ;D I’m so excited to be committed at something I’ve always wanted to do and definitely looking forward on your reply ! God speed! Cebu’s Lechon is one of the finest here in Vizaya. Hi Sheila, try Leona Bakeshop. It’s one of Cebu’s delicious pastry shop. Also, for food lovers try to visit Hukad at Ayala and Harbour City Dimsum House at SM Cebu. you’re mentioning food in cebu but you included goldilocks brownies?? Few weeks from now I’ll be in cebu. I will be experiencing the boodle fight in Captain A .Straight from the airport be seeing my family waiting for me in this place. For the Best Honey Roasted Chicken try Tiktilaok! They have different flavors which comes in Honey Roasted, Garlic, Spicy or Special(honey/garlic/spicy)They are located in almost all the leading malls. There price is so reasonable also! You’ve included most of my favourite food places in Cebu! I’m really happy for that! You should come visit us again as there is definitely more that the island has to offer. Really ? Brownie from Goldilocks ? You did not even try some of Cebu’s delicacy. You should have tried the mangoes, masi, noghiong, tuslob buwa, Ask a true Cebuanos where to eat. Steam Fried rice is to try also. Brownie’s from Goldilocks? lol! Pochero as they mentioned it. Marjo’s is a place to go to for Pochero. Hope this will help other people that does not know what to eat in Cebu.